May 2014 - Bring It! I have been diligently working on growing an asparagus patch for 4 years now. I felt almost self-actualized the other night when I picked enough asparagus from my patch without a supplemental bunch from the grocery store. It was blissful to see all those stalks coming out of the ground in my very own patch. Alas, the ability to pick a whole meal’s worth was short lived, but it was great while it lasted and the asparagus just keeps coming so it’s all good. What to do with this treasured vegetable? I searched websites and cookbooks and talked to friends about their favorite asparagus recipes in order to come up with something interesting. Then I stumbled upon this shaved asparagus salad recipe from a blog called The First Mess. At first I thought, what a shame to shave all those beautiful asparagus spears. Then I thought, what the heck, let’s give it a try. And oh, was it worth it. The shaved asparagus spear is such a great way to enjoy this treasured spring vegetable, and it’s always fun to try something new. As an aside, the shaving technique had a bit of a steep learning curve, but after a few spears-gone-bad, I had it down (NOTE: the key to shaving asparagus is to lay the asparagus flat on the cutting board while you shave, and not try to hold it in the air and peel it like a carrot). So, here it is, in all it’s spring glory…a modified version of the shaved asparagus salad recipe found at The First Mess. To make the dressing, combine the garlic, ginger, lime zest, lime juice, chili paste, agave nectar, vinegar, salt (if using) and pepper in a jar with a tight fitting lid. Stir to mix well, then add the sesame and grapeseed (or canola oil). Put lid on jar and shake vigorously to combine. Set aside. Combine shaved asparagus, red pepper, cilantro, and scallions in a bowl. Pour dressing on salad and combine. Garnish with pine nuts. When bringing this salad to your favorite party or event, keep nuts and dressing separated until right before serving. The asparagus can start to turn brown and get soggy if you dress too early. This entry was posted in Salads and Sides on May 27, 2014 by Sue Hanlon. Here, have a drink on us! Huge apologies to those of you who suffered through our rookie moves yesterday and got two posts that were basically about nothing. We were setting up the site for our Ingredient of the Month feature and two rogue posts of asparagus and strawberry nothingness went out. Not only are we apologizing, but we’re making it up to you by posting something super cool just in time for the long weekend. I heard about this last night from a fellow baseball mom, who like me really wishes it felt a little more like gin and tonic weather and less like red wine weather at this point. What Are You Drinking is an interactive site where bartender Rosie Schaat will mix you up the appropriate cocktail based on your choices in three simple criteria. Rosie writes the Drink column for the NY Times and also wrote a memoir called “Drinking with Men.” Suffice to say she knows her stuff, so when you tell her you are looking for a “crisp” drink with “Tequila” and are hoping for a “lively evening” she will take you right to a Tequila Highball. If you prefer something “fruity” with “rum” for a “sweltering day” she’ll steer you towards a spiked hibiscus iced tea. Sure, the virtual bartender has some serious limitations (Hellooooo? Where’s the vodka option?!?) but all in all it’s pretty cool, and at the very least it assures you’ll have at least one easy choice after 5 pm. Have a fun, relaxing, long-on-friends, light-on-work, everything-on-the-grill weekend, and do let us know if you liked what you ordered. Cheers! This entry was posted in Sips and Slurps on May 24, 2014 by Edie Morgan. It’s that time of year when salad greens are growing fresh everywhere and the excitement of gardening season is here. I love this short window in May where there are NO bugs and NO weeds. It won’t be long before both start to invade, but that’s okay because we live in New England and so we know how to cope. It’s part of the privilege of living in this paradise. This recipe is for quinoa, spinach, peppers and avocado, tossed in a ginger, lime dressing. It’s got some interesting twists and some deep flavors. You can substitute the spinach for any green and add other vegetables as you like. I think it is the almonds and dressing that give it the real kick. Enjoy your salads….enjoy your gardens…. and enjoy your spring! Coming soon to Bring It food blog….INGREDIENT of the MONTH. Watch for it in the next post. 1) Preheat oven to 325. In a bowl, toss together almonds, sesame seeds, honey and soy sauce until almonds are well coated. Spread into a single layer on a parchment covered baking sheet. Roast for 12-14 minutes (check after 10 minutes to make sure they are not getting too toasty!). Once seeds start to brown, remove from oven and set aside to cool completely. 2) Combine all dressing ingredients in airtight container and shake until well mixed. Taste and adjust seasoning if needed. 3) To assemble the salad, combine spinach, quinoa, red pepper, and cilantro. Drizzle with salad dressing and toss. Then top with almonds and avocado. This entry was posted in Salads and Sides and tagged Quinoa Spinach Salad on May 17, 2014 by Sue Hanlon. I’m not sure if he wants to eat them or throw them! It is fiddlehead season in New England! Fiddleheads are the furled fronds of young ferns (say that 10 times fast!). If you don’t pick them early in their growth cycle, they grow into beautiful ferns. But if you get them before they unravel, you will have delectable vegetable to serve fresh at the start of spring! Fiddleheads grow wild in wet areas of Northeastern North America. Foraging for fiddlehead is relatively easy. Once you find a patch, you will easily fill up bag fulls. But don’t eat them raw… they are toxic until thoroughly cooked. To me, fiddleheads are a cross between asparagus, spinach, artichoke and maybe even a hint of mushroom. They are both grassy and nutty. Suffice it to say, there is a lot going on with the fiddlehead in terms of flavor and they are delicious! Get them before the season passes because soon the morels will be popping up and we’ll have to move on. Below is a simple recipe for cooking fiddleheads. Happy Spring! Trim and rinse fiddleheads, removing any brown ends or mushy parts. In a large pot bring 2 quarts water to a boil. Add salt and fiddleheads. Cook 1 minute. Drain and rinse with cold water. In a large frying pan, heat oil over medium-high heat. Add fiddleheads. Cook, stirring, until they start to brown, about 5 minutes. Add garlic and red pepper flakes, if you like, and cook, stirring, until garlic is fragrant and just starting to color, about 1 minute. Salt to taste. Serve immediately. My niece foraging for dinner. This entry was posted in Salads and Sides and tagged Fiddleheads on May 12, 2014 by Sue Hanlon. La Salsa. Prepared and photographed by the chef. #nofilter, #yeah…right! Happy Ocho de Mayo! I know, I know. You thought I forgot about the annual excuse for midday margaritas. Not on your life! I merely saved it for a day more conducive to celebrating. God knows there are enough margarita recipes floating around so I’m giving you a healthier gift. In fact, I’m not even the one giving it—my son Oliver is. Two summers ago we sent the lad into the wilderness in a canoe for three weeks, and he came back knowing how to make his own salsa. Better yet, he knew how to make it by a campfire armed with nothing but a cutting board, a can opener and a knife. And the very best part was that he came back loving his homemade salsa. This from a kid, who, though good with roasted vegetables and the occasional carrot, had never previously eaten a raw tomato or pepper. “That was pretty much the beginning of my salsa eating career,” he reflects. I love this recipe because it is easy and infinitely tweakable for individual tastes. Some of us would add more onion and perhaps jalapeno, or maybe some additional seasonings. Others might get crazy and add mango or even jicama. But this is a great place to start, will be appreciated at any gathering, might just get your kids eating veggies and, if you keep your pantry somewhat stocked, will set you free from store bought salsa forever. Mix it all in a bowl. Enjoy it on chips, in burritos or by the spoonful, at home or by the closest campfire. Note: Chop the vegetables as fine as your patience allows. Our early versions were decidedly large format, but a finer texture gives your awesome salsa more versatility. 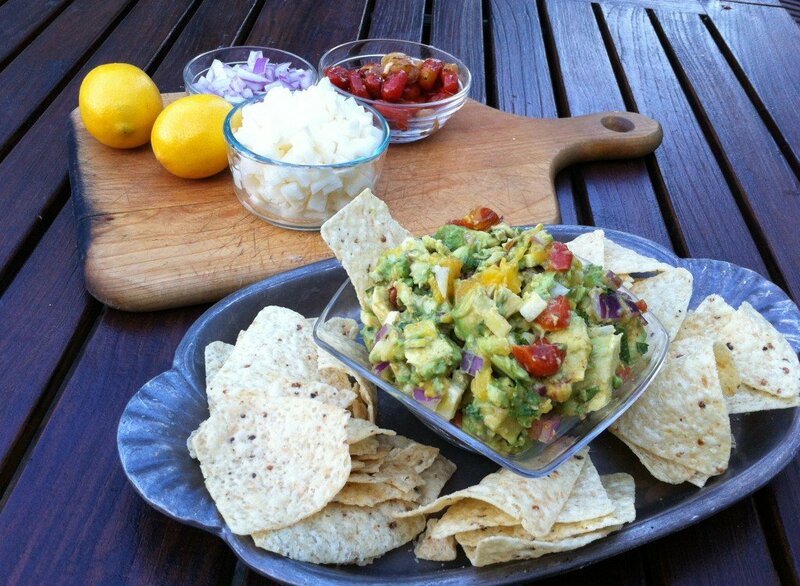 This entry was posted in Appetizers, Positive Snacks, Start it up, Veggie Delight and tagged camping food, canned tomatoes, mexican food, salsa on May 8, 2014 by Edie Morgan. You will think you are eating a fudge brownie – swear to god! The fun and festive highball post is a tough one to follow, but I am very excited about this energy bar post….so here goes… (and the highball post isn’t going anywhere except a little further down on the page). I’ve been working on creating the perfect energy bar for some time now. I’ve sorted through dozens of recipes and experimented on my own. I’ve made bars that are too chalky, too crumbly, too sticky, and too blah… until this past weekend that is! These bars are decadent tasting, healthy, and (the kicker) I made them in like 5 minutes. These bars mimic the infamous Lara Bar that you see in the “bar” aisle of the grocery store. If you are like me you stand in that aisle, staring at the enormous selection, completely overwhelmed, and walk out with nothing. That aisle can be daunting. There are so many choices, not to mention the price of some of those puppies (a bar for $2.50 -really?). This recipe promises to free you of the “bar” aisle all together. You will smugly walk past that aisle, knowing your homemade bars are far superior and far less expensive than anything they can possible stock at the grocery store. This recipe is essentially walnuts and dates – that’s it. The add ins make it fun and you can modify based on what you have on hand. I listed many options below. Bring extra for friends as they will quickly become a hot commodity. Blend all ingredients except any optional ingredients, in a food processor. Form into bars (I pressed into 8×8 inch square pan in order to get them to form and then cut into rectangles). If the bars are too crumbly coming out of the food processor, add a few more dates. Okay, how easy is that? Wrap in plastic wrap and throw them in your backpack for any outdoor activity you are planning. Or, throw them in the refrigerator for whenever you need to grab something quick. This entry was posted in Positive Snacks and tagged Energy bars on May 6, 2014 by Sue Hanlon.